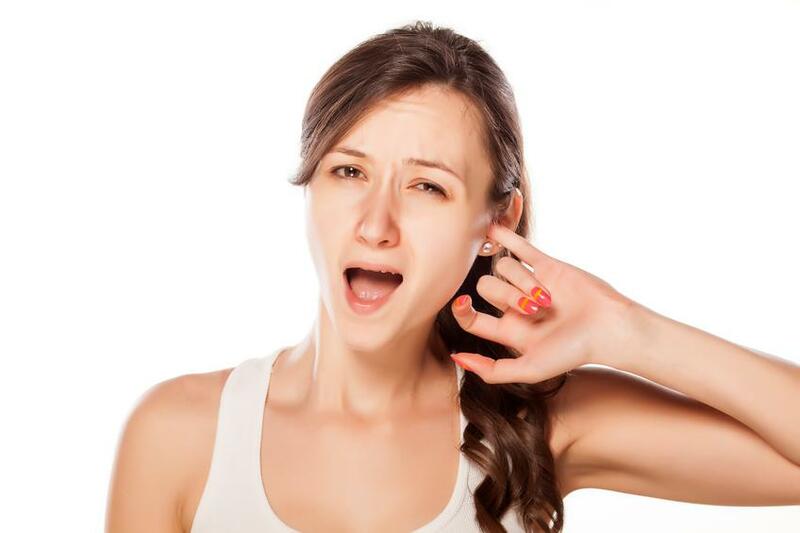 Home » General Health » Should You Pop a Pimple in the Ear? 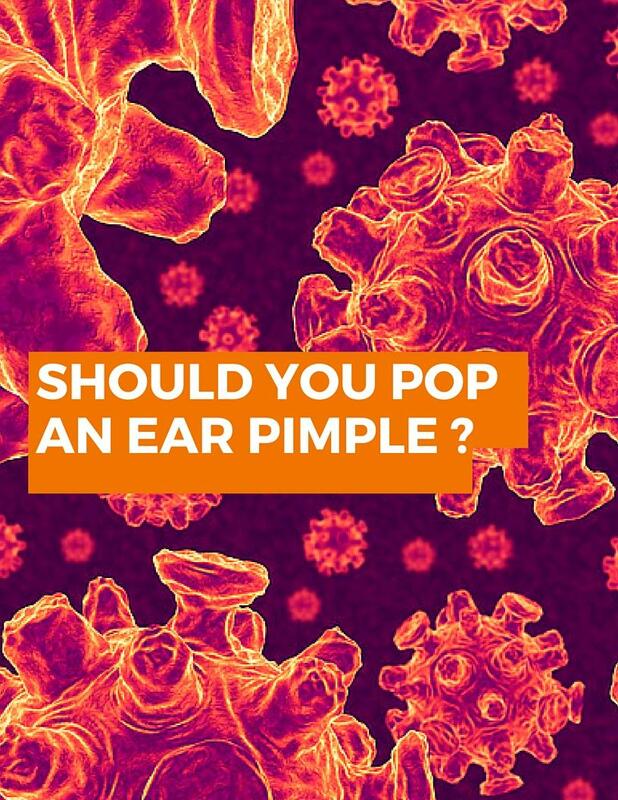 Should You Pop a Pimple in the Ear? A pimple in the ear is annoying and can hurt if it’s big enough. Of course the first thought is to get rid of the unsightly blemish and be done with it, but popping a painful pimple in the ear might not be the best idea (1). Ear zits can get infected much like acne and pimples on any other part of the body. Popping any zit can result in an infection, so it’s best to avoid the temptation. Even if you think you washed your hands thoroughly—and you most definitely should before touching any acne—there can still be germs underneath the fingernail that can get to the now open pimple, which is essentially a small but open wound. Talk to your doctor if you believe your recurring pimples are because of a hormonal imbalance. Learn how to cope better with stress in your life by meditating, doing yoga, or talking to someone you trust about what’s going on. A short 30-minute walk can also clear your head and lower blood pressure. An allergic reaction to cosmetics, medicines, and vitamins can cause pimples inside the ear and elsewhere. Greasy, fast food, processed foods, and foods with many additives can wreak havoc on the body and the lack of nutrition may exhibit itself in the form of acne. Try to eat nourishing, natural foods to get the vitamins and minerals your body needs, including fresh fruits and vegetables, lean meats, grains, nuts, and dairy. These can cause pimples in the ear because of the pressure applied when the helmet is rubbing against the ears. Wash the inside of the helmet with a face wipe or a cloth with some soap and hot water. Pay particular attention to the areas around the ears. And be sure to clean it each time someone other than you uses the helmet. These are notorious germ collectors and many people don’t give much thought to cleaning them. But they should be cleaned so as to avoid a buildup of dirt, oil, and germs that can be reintroduced to your ears each time you put them in. Wipe ear buds down regularly with a cotton pad lightly moistened with rubbing alcohol. Ouch! If you really want to know how to pop a pimple in the ear, read below for a relatively safe procedure. Gently apply pressure to the pimple from the base. If it doesn’t open up with gentle pressure, then leave it for a few days. Never stab at it with any object to get it to open because this can cause an infection. If you did succeed in popping the pimple, immediately wipe it with witch hazel, tea tree oil, or rubbing alcohol. Hold the cotton pad you used against the pimple and press firmly for a few minutes to stop any bleeding that may have occurred. Wipe the pimple with a clean cotton pad moistened with one of the above liquids. Apply acne cream if you have any on hand. For really large pimples that are bleeding quite a bit, apply hydrogen peroxide to sterilize the wound. If the pimple is sore, apply a hot compress (i.e., a face cloth, moistened with hot water) and apply to the pimple. Hold for a few minutes. Now leave the pimple alone to allow it to scab over and heal. You can keep applying acne gel or tea tree oil a few times a day to speed up recovery. The above works for wherever a pimple may appear, whether it’s a pimple on the outer ear or a pimple on the earlobe. 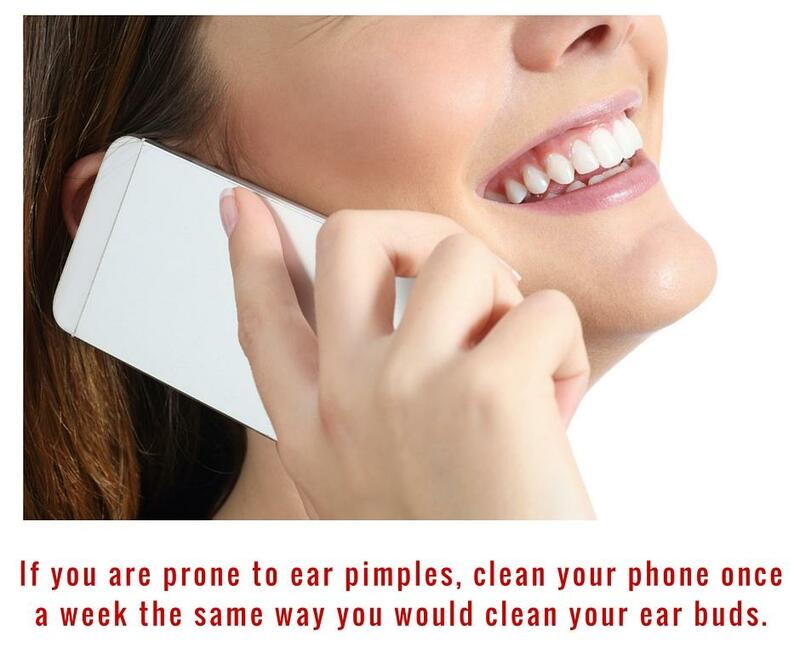 If the pimple is in the ear canal, extra caution needs to be taken because you could potentially do damage to the inner ear and you don’t want cleaning agents to drip inside. If the pimple is very large, swollen, painful, and filled with a great deal of pus, it’s better to have someone help you, or see a doctor. If a pimple keeps reappearing and becomes red and inflamed, you should see your doctor; they might prescribe antibiotics if an infection is present or suggest a strong medicinal topical cream. If you have blackheads in the ear, you can still use the steps outlined above, but you can’t pop a blackhead—they need to be extracted. If you try to squeeze the blackhead (which is black because of grime and oil trapped in the pore) you will only irritate the skin. Professional estheticians can remove it properly with minimal damage to the skin by using extraction tools. The ears can get overlooked while bathing, which can result in natural oils mixing with dirt and then sitting in the crevices. This may lead to clogged pores and the development of acne. Be sure to wash the ears thoroughly every time you shower. Take a warm facecloth, with or without soap, and run it along the back of the ear, inside the opening before the canal, and even within the canal. Swipe gently but with enough pressure to remove any lingering wax and dirt. 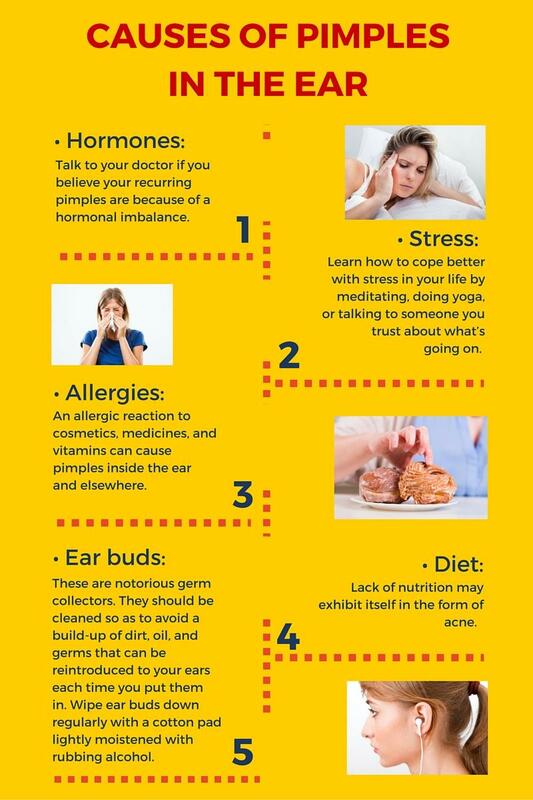 Do not scratch your ears with keys, toothpicks, pens, and the like—these all have germs on them and all you’re doing is transferring said germs to your ears. Not a good idea. If you wear ear buds, be sure to clean them weekly. Take a cotton pad and lightly moisten it with rubbing alcohol. Swipe the ear buds with the moistened pad to remove any wax and grime that has built up from use. Also, don’t share ear buds with anybody. Instead of rubbing alcohol, you can use tea tree oil to fight and prevent infection that may result from a pimple on the ear. Tea tree oil is a natural antibacterial and an excellent remedy for acne anywhere on the body. It’s strong and can burn a bit because it’s so potent, but that feeling will pass, and the oil will start to heal the acne. Use a clean cotton swab when applying it. If tea tree oil and rubbing alcohol irritate your skin, try witch hazel. It’s a gentle, soothing antibacterial used to treat simple wounds. If you have facial acne, it’s safe enough to use full strength. It can be purchased at most drug stores. Wash your hair at least twice a week. Oils can travel around both inside and outside your ear, and this can cause clogged pores resulting in pimples in the ear. Clean your phone once a week the same way you would clean your ear buds (see above).